Angelina County Courthouse Lufkin Texas. Angelina County is named after an Indian girl who became an enthusiastic convert of the Franciscan missionaries. A bronze statue across from the Museum of East Texas honors her. Jonesville was the second of Angelina County�s four county seats, sandwiched between Marion and Angelina (aka Homer). It served in this capacity from 1854-1858. Jonesville never grew and in it�s short reign as county seat and they never got around to building a courthouse. County offices were rented. Homer became the Angelina County Seat in 1858 after defeating Jonesville in a contested election. Homer�s name was changed to Angelina at this time, but the name didn�t gain favor and it was officially changed back to Homer in 1862. 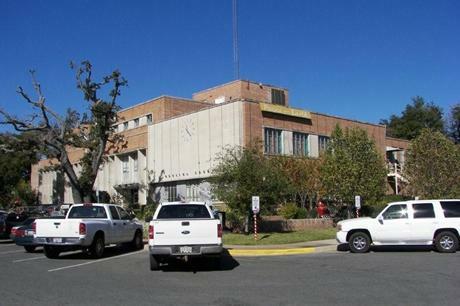 Marion, Texas (being the first Angelina County seat) had retained the county�s first (log) courthouse. Since Jonesville never built one, the courthouse was dismantled and moved to Homer where it was used until it was replaced by a two-story frame building in 1873. Homer became the county�s most important town � with only Lufkin as a near rival. The tables were turned in the early 1880s when the Houston, East and West Texas Railroad bypassed Homer in favor of the more direct path through Lufkin. It retained the courthouse and a population in the 300s through the rest of the 1880s. In late 1891, Homer�s courthouse burned. 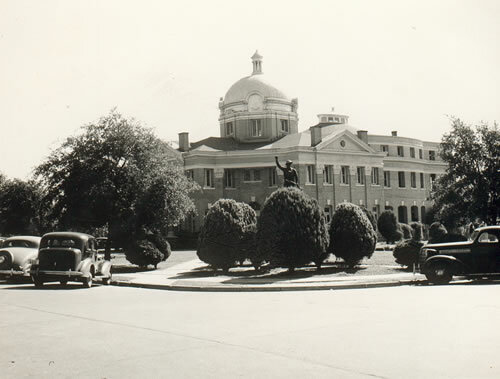 The more prosperous city of Lufkin became county seat the following year. 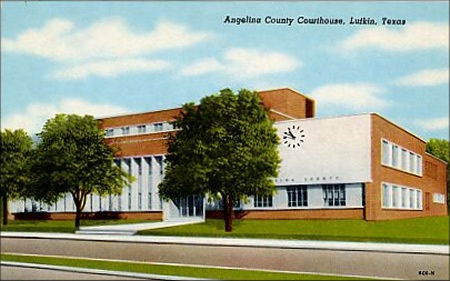 "The uninspiring 1955 Angelina County courthouse in Lufkin." "[I]n the l950s, many Texas counties threw aside history, tradition and elegance and replaced some of our finest courthouses with modern buildings -- many of them with little character or appeal. That happened in my home town of Lufkin. 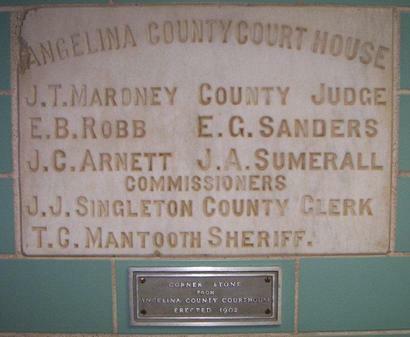 "The cornerstone from the 1902-03 Angelina County courthouse embedded in a wall on the first floor of the current courthouse." 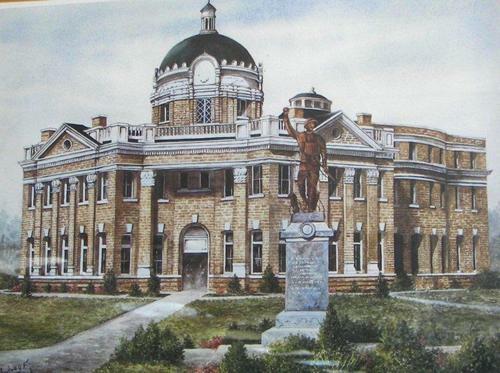 "The 1902-03 Angelina County courthouse designed by architect James Riely Gordon. This painting, by artist Audrey Midford, is hanging in the county clerk's office in the current courthouse."